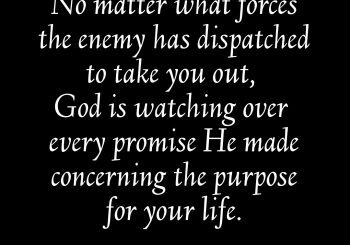 No matter what forces the enemy has dispatched to take you out, God is watching over every promise He made concerning the purpose for your life. 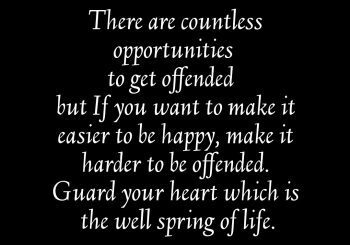 There are countless opportunities to get offended but If you want to make it easier to be happy, make it harder to be offended.Guard your heart which is the well spring of life. Truth be told, there are 4 kinds of people who will come along your path in life, whether you like it or not. Those who ADD, SUBTRACT, DIVIDE & MULTIPLY. However, those who do not increase you, will inevitably decrease you if you permit them to. 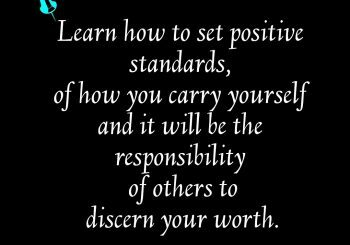 Learn how to set positive standards, of how you carry yourself and it will be the responsibility of others to discern your worth. Make no friendship with an angry man,and with a furious man do not go,lest you learn his ways and set a snare for your soul. 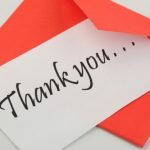 Enjoy every opportunity and give God thanks in every trial. 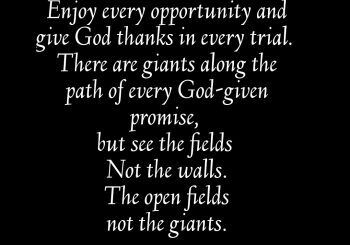 There are giants along the path of every God-given promise, but see the fields Not the walls. The open fields not the giants. 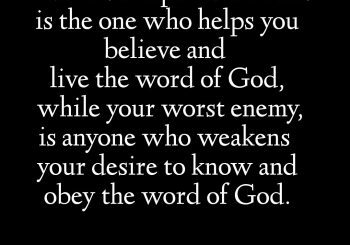 Your most important friend is the one who helps you believe and live the word of God, while your worst enemy,is anyone who weakens your desire to know and obey the word of God. Whenever we fail to obey God and take His instructions for granted, He will always raise other people who will complete the task. 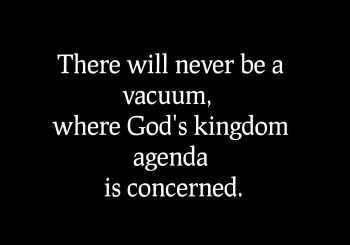 There will never be a vacuum, where God’s kingdom agenda is concerned. But when he saw many of the Pharisees and Sadducees coming to his baptism, he said to them, “Brood of vipers! Who warned you to flee from the wrath to come?Therefore bear fruits worthy of repentance, and do not think to say to yourselves, ‘We have Abraham as our father.’ For I say to you that God is able to raise up children to Abraham from these stones. 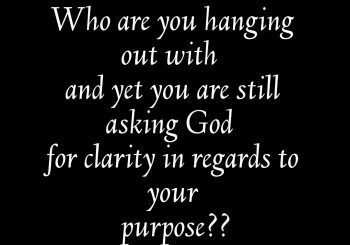 Who are you hanging out with and yet you are still asking God for clarity in regards to your purpose?? 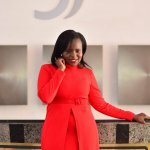 Birds of a feather flock together, hang out with great minds and they will sharpen you however, spend time with bad company and they will cloud your Spirit, from hearing God’s voice in regards to your purpose. There is absolute no profit whatsoever, trying to play house, with people,who are moving towards different directions, from the direction God is trying to direct you. 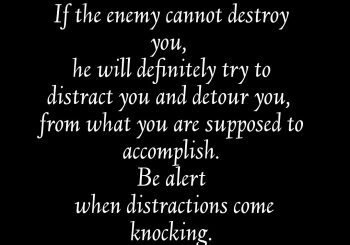 Please hear me out my beloved,God is the only one qualified to direct your story.Get to move to the direction He is sending you, than wasting an entire season moving away from the right path. 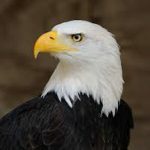 Eagles Never Tear Each Other Down.